Everett L. “Bob” Hammond passed away Sunday November 11, 2018. Funeral Services: 10:30 a.m. Friday in Biggers Funeral Chapel. Interment: 1 p.m. Friday in Dallas Fort Worth National Cemetery. Visitation: 6 to 8 p.m. Thursday at Biggers Funeral Home. Memorials: In lieu of flowers, please make donations in Everett’s name to www.woundedwarriorproject.org and/or www.honorflightdfw.org. Bob was born February 10, 1932 in Lampasas to the late Elza Hardin Hammond and Lou Emma Bailey. He proudly served his country in the U.S. Army during the Korean War. After his honorable discharge from the military he had a couple of jobs before he began a career in construction sales that lead to him opening his own construction company, Ham-R-Kee Home Designers and Bob Hammond Construction, which he operated from 1968-2012. 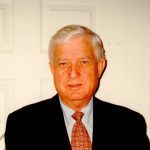 Bob volunteered at the Northeast YMCA for many years where he enjoyed countless hours coaching his son’s sports teams and leading many youth, fundraising and membership programs. One of the highlights of Bob’s life was when he married Carol Woolfolk and had their son, Chris. He was a dedicated father, a loyal friend and was passionate about working with kids/young people. His fondest memories were coaching Chris’s sports teams, hunting with Chris and Chris’s Uncle Dale Keele for 22 years. He loved his grandkids and his sister, Kay, who was his best friend and confidante until the day he died. He was incredibly grateful for Sharon McKelvey, all the things they did together and shared, and her family who treated him as their own. Bob was preceded in death by sisters, Frances McElroy and Connie Cooper; and brother, Joe Hammond. Survivors: Son, Chris Hammond and his wife Tessa; grandson, Cashten; granddaughter, Cambria; stepdaughters, Vanessa Rodgers and Jaime Waller; sister, Kay Keele; brother, Wayne Hammond; and numerous special nieces, nephews and cousins. Be the first to share a memory of Everett .